Last week I was drinking my morning java, watching a little HLN with Robin Meade as per my usual routine. I usually don’t rant on social media, but a story that HLN featured had me in a ranting kind of mood. Some news reporter named Britt McHenry had her car towed while dining out with friends. I have never heard of this women prior to this event, so I can’t say much about her character as a TV personality. Now, having your car towed must be a frustrating experience. It has never happened to me, but I can imagine coming out of a restaurant/mall/event only to discover that your car is gone is very upsetting. I have been in various frustrating situations. Banking error mishaps made by a teller, lost luggage, stolen credit card. Being put on hold or given the brush off or run around can be very frustrating when you are already in a bad mental place. However, is it okay to behave badly? As she snatched her keys, she turned to the employee with one final jab (as though she didn’t jab enough) with this, “yea, lose some weight honey (or sweetie). I’m on TV and you’re stuck here in a trailer.” I do not care if you are the most educated person in the world. Your words made you look foolish. I don’t care if you have the best, dazzling set of teeth in all of North America, along with the hottest bod to boot. Your words make you very ugly. I don’t care if you have the best paid job with six figures or more. Your words have made you poverty-stricken. Now, as I said I don’t know this woman from Adam. Her emotions may have gotten the better of her, but I still feel staying in control of your emotions speaks volumes. This display tells me that Ms. McHenry has a propensity to behave this way when things don’t go her way and can be irascible in nature. It’s okay to be frustrated and expect good service. It is never okay to be a jerk. So my friends, to me the tow truck worker came out on top. With all of Britt McHenry’s college credentials, booming bod, and perfect news anchor smile, she was looking like one ugly person on the inside. Starting to Thrive with the Five by Five! I know it was terrible. I have literally met people I thought were gorgeous…then after they talk….they become ugly. Oh me too. I’ve met a few people in my time whose personality made them very unattractive. It’s sad. Thanks so much for your kind words, Ellie. I think people with this mentality don’t even think of God or his gifts. They feel looks and money give them a pass to say what they feel. I just hope this was a learning experience for her, and she realizes what she said. I always say, watch your words because you can’t take them back. Beauty is definitely an inside job! Great post! Thank you. Kindess really makes a person beautiful! Woah, that’s terrible! I can’t believe all of those horrible things she said. I can’t imagine ever saying ANYTHING like that to ANYONE! So sad. I love how you handled your dining experience though. You handled it so well and with class! Why thank-you, my dear. We were mad, but always tried to remain respectful too. I felt awful for the poor attendant. Beauty is both inside and out, and she is missing that inside part! Definitely missing the inside part. That someecard at the bottom made me chuckle. Kindness goes such a long way!! Far more than “outside beauty” does…. I always remember a beautiful deed over a beautiful face. 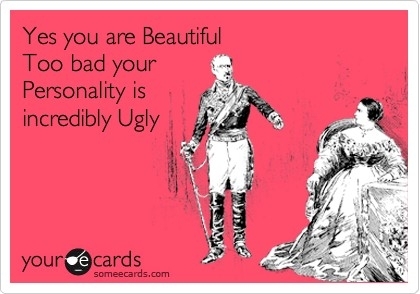 Someecards is so great with a humourous but truthful message. Oh my, that’s rude! I agree with losing50laps, beautiful starts from within.. I always say I remember a beautiful deed over a beautiful face. So true.